From world-class casinos to online bingo halls, bingo entices a following of gamers who excitedly play their cards in hopes to be the next big winner to call out—”bingo!” Bingo has evolved into a contemporary hyped-up gaming event offered at churches, bars, parlors, online casinos, and even cutting-edge casinos. Imagine Saturday night “after dark” bingo at a state-of-the-art bingo hall that practically replicates a nightlife clubbing atmosphere. The DJ host gets the party started with dancing and upbeat hits as a killer light show and glow necklaces illuminate the dimly lit space. Casino bingo certainly deviates from your stereotypical church hall bingo played by seniors. Yet, diversity is exactly what makes this game so universally loved and enjoyed. Here’s how bingo has grown to be such a worldly and versatile game of chance played in person at halls and virtually on mobile devices. Bingo originated in 1530 as the Italian National Lottery game Lo Giuoco del Lotto d’Italia (which is actually still played regularly in Italy. Today and contributes more than $75 million to the government’s budget annually). This French-established Le Lotto design served as the basic template for the modern bingo game. By 1778, the social class intelligentsia and aristocracy adopted the classic version of Le Lotto created by the French. The game consisted of randomly numbered (numbers 1 to 90). As well as blank unique playing cards divided by three horizontal and nine vertical rows. The caller would take a wooden numbered token from a cloth bag and read it aloud. Players responded by covering the numbered square if it was on their card. The first player to complete a horizontal row was the winner, according to StrangeLife.com’s excerpt from “Gambling Times Guide to Bingo” by Roger Snowden. Then during the 1950s, a German educational version of the Lotto game was designed to teach children multiplication. Other educational Lotto games enhanced spelling, animal and history curriculums. In 1929, Edwin S. Lowe, a toy salesman from New York, is historically known as the inventor of today’s American Bingo. He discovered a variation of Lotto called beano at a country carnival near Jacksonville, Ga. Lowe watched as a pitchman would draw a wooden disc from an old cigar box and call out the number. If a player had the number on their card, the player would cover the space with a bean. Once someone covered an entire row (horizontally, vertically or diagonally) with beans, that player would shout “beano!” and was declared the winner. Popularizing the game, Lowe brought beano back to New York and played with friends using dried beans, a rubber stamp for numbering and cardboard. Played with just as much excitement as in the carnival tent, beano was a big hit. One player excitedly shouted “bingo!” instead of “beano!” once she completed a row on her card—and the game of bingo was born. 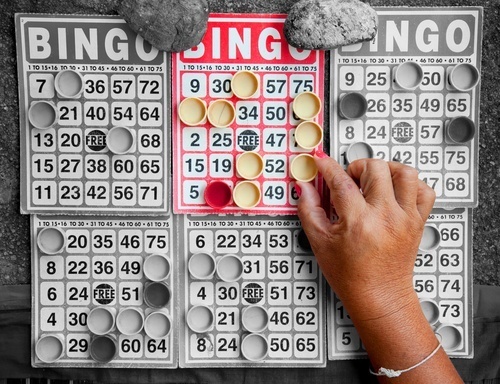 As Bingo became a widespread gaming phenomenon, a priest from Pennsylvania approached Lowe about using bingo to help alleviate the church of its financial troubles. The only problem was that using several of Lowe’s bingo sets produced too many winners. This led to the idea of transforming the game on a larger scale with more combinations of numbers to accommodate a fundraising capacity. Lowe partnered with Carl Leffler, a mathematics professor at Columbia University, to develop 6,000 new and non-repeating bingo cards. The church of Wilkes-Barre successfully used the extensive card collection for its fundraising efforts. Thereafter Lowe published a bingo “Instructional Manual” and bingo-absorbing monthly newsletter “The Blotter” that had 37,000 subscribers, according to StrangeLife.com’s “Origins of Bingo” page. Lowe played a hand in creating a classic gaming perennial that once was once played by 60,000 players in the New York’s Teaneck Armony. Known as the biggest bingo game in history, this game gave away 10 cars to the winners. Along with the United States, bingo maintains a strong presence in the UK, especially online bingo. BBC.com reports that as of 2013, about 350 bingo sites operate in the UK. Players see bingo as a social hobby with winnings, and for Anita Heffernan, she’d much rather play bingo than spend a night out on the town. Anni Nevison also enjoys playing online bingo because of the “excitement” and friendship.” A bingo site provides a communal space where people can chat. Also to become family as they play. Unlike traditional bingo halls, online bingo halls are vibrantly interactive. Yet, whether someone plays online or in a hall, bingo fosters a social environment. It also also creates a sense of increased wellbeing. This game of chance continues to be an exciting hobby. In addition to a favorite past time and even Saturday night party, from online bingo sites to premier casinos. Get in on the fun by checking out our online Bingo Game Tutorial that teaches how to play, rules, odds, and strategy.